Take care of every corner of your home both inside and out with home garden tools and household solutions. Whatever Works Catalog has all the household solutions you'll need to keep your home in great condition. Home Garden Tools - Find all the tools and home garden solutions to keep your outdoor area looking great. From furniture and decor items to lawn and garden gadgets and lighting, Whatever Works has great gifts and gadgets for any outdoor enthusiast. Enhance your garden or maintain your pool with clever products from Whatever Works. Household Solutions - Whatever Works Catalog can solve your home dilemmas with easy-to-use household cleaning solutions and other home items that will make your day a little bit easier. From home repairs to home garden tools to organization items, you'll find everything you need for inside and outside your home. You can even shop for supplies for your pet including training tools, gates, beds, vacuums, and more. Even find ways to keep bugs out of your home with unique pest control ideas and other household solutions. Whatever Works also has household cleaning solutions that will make cleaning easier. Garden Pest Control Products - Critters can become a problem in many home gardens. Whatever Works offers simple solutions that take little time and effort to keep bugs away from your plants and far away from your home. Aerators, cultivators, weeders, and other home garden tools are great for keeping your garden looking great. Garden and patio decor - Create a patio that your friends and neighbors will be jealous of with garden and patio decor from Whatever Works Catalog. Add some fun to your yard with patio accessories, entertaining ideas, and more. 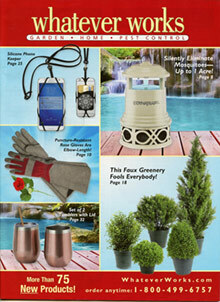 Pumps, sprinklers, home garden tools, decor and other yard accessories make gardening easy year-round. Even shop for plants that you can incorporate directly into your garden as well as a large selection of home garden tools. Taking care of your home and garden is easy with household solutions and home garden tools designed to make large jobs easier. Whatever Works offers lawn and garden fertilizer, household cleaning solutions, and garden pest control products to create a beautiful atmosphere both inside and outside your home.